Austin Community College (ACC) values being able to distribute important information to staff and students quickly. After years of not addressing their communications strategy, they decided it was time to implement a clear and well defined campus communication strategy. After looking into a few options, ACC decided that digital signage would be a powerful way to accomplish this. 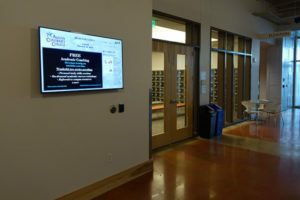 However, their current impression was that digital signage required a hefty investment, and that's why it had not been a priority for the school. Fortunately, after looking into multiple vendors and being introduced to Rise Vision, they were happy to see that they could get started for free. After exploring the Rise Vision platform, ACC realized they could have enterprise-grade features with a free, cloud-based platform. This, coupled with Google Chromeboxes provided by Dell, made it easy and cost effective for them to deploy signage across their district. 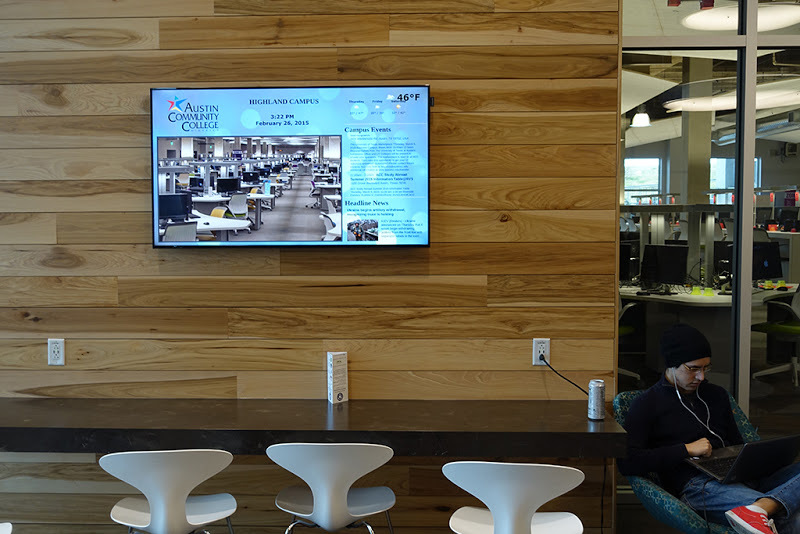 Before starting off with Rise Vision, ACC implemented their first digital signage network which consisted of Roku 3 boxes and a Picasa channel to display simple full-screen signage on a few LED TVs. The players were inexpensive, but the graphics for each campus display did not automatically update. It required them to manually restart the Picasa channel every time they needed to refresh the content. would offer widgets to incorporate dynamic data such as RSS feeds, Twitter, Google Spreadsheets, and more. To get started, ACc organized multiple demos with various digital signage companies. Through the demos they evaluated many very nice products. But even with education discounts, the costs did not align with their basic needs and the budget thry had allocated. After being introduced to Rise Vision, however, they were pleasantly surpirsed to discover that they can have all the features they need at a reasonable price. Today ACC has 25 Chromeboxes, installed behind 55-inch LG and Samsung TVs, spread across 4 of their 11 campuses: Northridge Campus, Highland Campus, Elgin Campus, and Hays Campus. The combination of Rise Vision’s digital signage platform and Dell Chromeboxes allows ACC to easily share college-wide information about student life activities via an RSS feed and today’s events through a shared Google Calendar combined with images and videos. It has really helped to simplify their campus communication strategy! Looking for More Digital Signage for Education Success Stories?